(UPDATE) Incumbent Debbie Wasserman-Schultz beat Tim Canova by 14%: she got 28,250 votes and Tim Canova got a very respectable 21,476 votes. Daisey Baz (D-114) romped in her primary for state rep, but Ross Hancock (D-115) cratered, which is a shame. Scott Fuhrman easily won the right to run into the Ileana Ros-Lehtinen buzzsaw. (UPDATE) Marco Rubio won big in the Republican primary, and will face Republican Democrat Patrick Murphy. Pretty final tally is Murphy 59%, Grayson 18%, Keith 15%, Roque De La Fuente 5%, Reginald Luster 3%. It will be hard to vote for Murphy. Rubio makes it conceivable, though. (UPDATE) One of the most exciting local races is the non-partisan Mayor’s race, where at 11pm with 760 of 783 precincts reporting, Mayor Gimenez has only 47.64% of the vote – not enough to avoid a runoff against Raquel Regalado (32.01%). That’s a surprisingly poor showing for him given his enormous financial edge. And in FL-26, with all but 8 of the 197 precincts in, Joe Garcia is just edging Annette Taddeo by under 4% of the vote. It’s only an 800 vote gap which is a weak showing for Joe who nonetheless seems likely to be the one to go on to face the vulnerable one-term Republican incumbent. I hated this race as I like both candidates as people; on the issues Taddeo seemed a little better. On electability, I just don’t know; Joe has slightly longer roots in the district, which could be a help. The judicial races are often odd and this year is no exception. Judge Bloch is losing – has almost certainly lost – to Marcia Del Rey in Circuit Court Group 9. He had a bad campaign, and filed (and is now appealing!) what seemed to me an ill-advised lawsuit, but she shows no sign of being qualified. This is the worst outcome of this set of judicial races by far. The four-person race in Group 34 is clearly headed for a runoff, and Mark Blumstein (28.73% with 723/783 precincts counted) looks sure to be one of the candidates. The other three candidates are all very close to each other. At this moment, Luis Perez-Midina is ahead by 2,000 or so votes over Renee Gordon in the race for second place, which would mean the runoff would be between the people who I thought were the two less-attractive candidates in a strong field. The votes here were all split nearly evenly: 28.73%, 24.57%, 23.58%, 23.11%. I wouldn’t be shocked if someone asked for recount before it’s all over. (UPDATE 11pm) No major changes here. Blumstein 28.69%, Perez-Medina 24.53%, Renee Gordon 23.69% The gap between the last two is almost 2000 votes, and only 23 precincts left. In Group 52, Rosy Aponte, the worst candidate, lost but took a quarter of the vote, forcing the two good candidates (Breece and Rodriquez-Fonts) into a runoff. Whoever wins in November, we already won this one. Judge Luck won re-election in Group 66, as did Judge Sarduy in Group 74. In the County Court races, Judge Newman seems likely to have won re-election in Group 7; he’s ahead by 8,000 votes – which is about 3% of the votes counted so far– with 60/783 precincts to go. Judge Graham romped in Group 35. Linda Luce won even bigger in Group 15. (UPDATE 11pm) But Group 5 is the nail-biter: at 11pm Milena Abreu has 49.87% and Judge Seraphin only 50.13% and the gap between them is 525 votes, with 23 precincts to go. (UPDATE) Forgot to say, Amendment 4 passed overwhelmingly, with 74.22% of the vote at this point. Of course now we have to fight the poison-pill of Amendment 1, which undermines solar power. And if they both pass they arguably contradict each other in part — will the second in time prevail? (UPDATE) Looks like a runoff for School Board District 6, as Maria Teresa ‘Mari Tere’ Rojas wasn’t quite able to buy the election, only getting 48.07% of the vote so far. Although Modesto ‘Mo’ Abety is clearly second, he was very far behind with only 24.91% of the vote (87/90 precincts). But it’s a different electorate in November. Meanwhile in the County Commissioner race for District 7, no surprise that Xavier Suarez took 72% of the vote. (UPDATE 11pm) Only 23 precincts to go, and Judge Seraphin is ahead by 525 votes, a slight gain. But still close. Bloch remains 9,000 votes behind Del Rey. Let’s hope the rumors are true and she is angling to be the next Judge Judy on TV. For a very long time I’ve had a comment about the Miami weather in the last line of my email .sig file, something like “It’s hot here” or “It’s cool here” or occasionally “It’s @#$@#$ hot here.” This started out largely as reaction against the pretentious .sig files I ran into surprisingly often in the early days of the net. But it was also driven in part by our remarkable weather in Miami: way too hot six months of the year, lovely five months of the year, and pot luck on the balance. I had imagined that the right way to do a .sig file modifier on a unix box would be to do something to the mailer daemon to instruct it to pull the weather data in real time. But because my mail is on a university machine, I don’t have the privileges to do that, and even if I did I don’t think I’d mess with their mailer. So for 20+ years I did the weather line by hand, changing the last line of my .sig file a few times a year to reflect the change in the seasons, at least when I remembered to do it. And from time to time I wished for something automated that would check the weather every time I sent an email. This summer I finally broke down and took a few hours and wrote a little script that grabs weather data from a public source and re-writes the text of my .sig file every hour based on the temperature and humidity. It’s not elegant, but modifying the text of the saved version of the .sig file means I don’t have to tangle with the mailer itself. It also means I use a lot fewer system resources when sending mail, plus it limits my lookups of the weather data. It shouldn’t have taken a few hours, but I had to learn about how to handle arrays in PHP, plus my data source was badly documented and somewhat inconsistent in what it returned. Overall, a silly thing to do, yes, and rather late to the party, but I’m happy about it anyway. I Spent 5 Years With Some of Trump’s Biggest Fans. Here’s What They Won’t Tell You. Don’t be put off by the tabloid tone to the headline that Mother Jones slapped on this article, there’s a lot of smarts here. How wary should a little-bit-higher-up-the-ladder white person now feel about applying for the same benefits that the little-bit-lower-down-the-ladder people had? Shaming the “takers” below had been a precious mark of higher status. What if, as a vulnerable blue-collar white worker, one were now to become a “taker” oneself? Trump, the King of Shame, has covertly come to the rescue. He has shamed virtually every line-cutting group in the Deep Story—women, people of color, the disabled, immigrants, refugees. 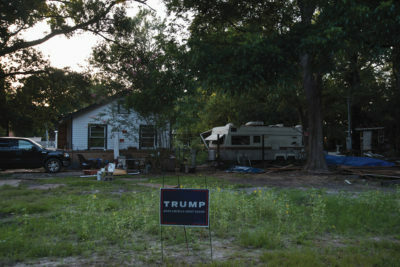 But he’s hardly uttered a single bad word about unemployment insurance, food stamps, or Medicaid, or what the tea party calls “big government handouts,” for anyone—including blue-collar white men. In this feint, Trump solves a white male problem of pride. Benefits? If you need them, okay. He masculinizes it. You can be “high energy” macho—and yet may need to apply for a government benefit. …. But in another stroke, Trump adds a key proviso: restrict government help to real Americans. White men are counted in, but undocumented Mexicans and Muslims and Syrian refugees are out. Thus, Trump offers the blue-collar white men relief from a taker’s shame: If you make America great again, how can you not be proud? Mayor’s Race: The Devil You Know or the Devil You Know? The Mayor’s race presents a stark choice between an incumbent who does not deserve re-election and a challenger who hasn’t made the case that she would be a good steward (if anything, rather more the opposite). I really don’t want to vote for Mayor Gimenez to be re-elected. I’m not against measured development, but he’s for anything glitzy-sounding, be it an oversized mega-mall in the north end of the county, or selling a county golf course to Donald Trump. I wasn’t a fan of the Pets Trust, but the voters voted for it, and Gimenez undermined their decision. Also, I haven’t forgotten Gimenez’s war on the library system, which I think of as one of the few jewels in Miami-Dade’s civic crown. He lost that one, so no lasting harm was done, but it shows a very poor disposition. Gimenez shafted county workers, and it took a costly court battle to set him straight. And his son is a county lobbyist, with the wrong sort of clients. Raquel Regalado, 36, is a trademark and patents attorney with a law degree from St. Thomas in 2001. While I do think legal training is a good background for the school board, and it would be nice to have a younger member of the Board, it’s hard to think of many legal specialties less relevant to the job. (Now, a real estate attorney or CPA….) Indeed, the candidate’s resume generally seems rather light on relevant experience. The Herald endorsed Regalado as did the United Teachers of Dade, the teachers’ union. (I would expect better from the Herald. Sadly, I don’t expect better from the UTD.) The elephant in the room, however, is the identity of Regalado’s father, a subject explored in the Miami New Times’s With No Experience and Lots of Cash, Miami Mayor’s Daughter Raquel Regalado Runs For School Board. Opinions differ about her tenure on the School Board. Her now-former colleagues (Regalado resigned to run for Mayor) say nice things. Her opponents cite her alleged absenteeism or lateness to meetings, which looks high on paper, but her defenders say looks less bad when one considers that (1) she had a live radio show to do (people have to eat); (2) the portions of the meetings she missed were overwhelmingly ceremonial; and (3) in all or most cases the important substantive votes she missed were not close votes where he presence would have made a difference. No, the real rap on Regalado has two parts: lack of competence (not numerate, not detail-oriented) and likely to sweep in her father’s cronies. Dad is the Mayor of the City of Miami and he, and especially the cronies, are said to meet or exceed Miami’s ordinary quota of corruption. Raquel Regalado, who is the daughter of current City of Miami Mayor, Tomas Regalado, has a history of being involved in questionable financial dealings, some of which occurred during the time she was campaign treasurer for her father’s Mayoral race in 2009. Both Tomas Regalado (recently appeared on the HBO Show “Ballers”) and Raquel Regalado, agreed to pay fines and penalties of $5,000 each for their part in the bookkeeping. To make things worse, in September 2011, law enforcement officials investigated campaign finance violations by both City of Miami Mayor Tomas Regalado and campaign treasurer Raquel Regalado, revealing that criminal campaign violations that included forging campaign financial reports, were made. A forensic auditor ultimately outlined six violations of Chapter 106 of the Florida Statutes dealing with Campaign Financing, involving the Regalados. But if things couldn’t get any worse for Regalado. The Miami Herald reported that back in August 2011, Miami-Dade School Board member Raquel Regalado was nine months late in filing her final campaign finance report, leading to a $3,526 fine being accessed against her. Yes, she moved out of her house and into a rented home. She was in the midst of a contentious divorce and her ex-husband had a claim on the house they had once shared. Meanwhile, the bank was foreclosing because she could not afford, as a newly-single mother, both the mortgage payments and her daughter’s autism therapy. It was not a difficult decision for her to make and any parent can understand. She abandoned the house so that her ex-husband would take up residence and possession of the home he had some rights to, as per the divorce settlement. He had every intention of moving into the home. When he didn’t, the foreclosure moved forward. She never rented the house to anybody, as is the case with real Homestead exemption fraud cases. Nor did she claim another Homestead exemption on the new home, as other people committing fraud do. She didn’t stay and live in the house for free during the foreclosure. And, in fact, since she wasn’t paying the mortgage, she didn’t continue to pay the taxes on it. Property Appraiser Pedro Garcia said the property taxes for both years that Regalado didn’t live in the house were paid for by the mortgage company that took possession of the home. Foreclosure proceedings take time. Her name was still listed on the property but the home was no longer Raquel’s. The bills were paid by the bank. So the oversight isn’t even hers! The mortgage company got the tax bill and paid it, failing to make the changes to indicate there was nobody living in the home anymore and that it was in the process of foreclosure. So, more incompetence, not malice. Even if that’s right, and who knows, what a great choice to have to make. It looks as if the developer-financed Mayor is going to win this one, so maybe I’ll just vote Regalado as a protest. But if it looked as it was going to be close it would be a tough one. My rule of thumb is that a tropical wave I don’t drive anywhere, but don’t take in the outdoor furniture. Tropical Storm, I take in the furniture. Worse than that, it is time to stock up on hurricane supplies and gas for the generator. Historically, category 1 storms can cause of damage to trees and power lines but our houses are hardened. I can’t think of a Category 2 in recent years, but in theory the area is hardened for those too. Worse than that, time to worry, although my house was rennovated a few years ago, and now is supposed to be able to withstand a Category 3 at least, and maybe more. Hurricane Andrew was a Category 4 and it was devastating to the community. The biggest damage was caused by tornadoes spun off the hurricane. Unlike in the Midwest, there’s really no way to see them coming due to the giant storm around them. And of course we don’t have basements to hide in either. A new complication this year is that big storms, even the less destructive ones, leave big pools of standing water behind them. Mosquitoes love those…which means more Zika….